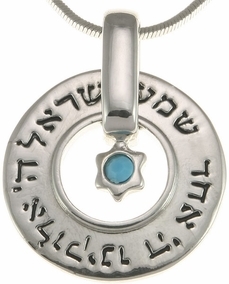 Yisrael Charm . 7/8" Diam. Shema Yisrael (Shma Israel, Sh'ma Yisroel, Shema Israel, Shma Yisrael or just Shema), "Hear, O Israel", are the first two words of a section of the Hebrew Bible, the Torah, is a centerpiece of the morning and evening Jewish prayer services. "Hear, O Israel: the Lord our God, the Lord is one," is found in Deuteronomy 6:4. Observant Jews consider the Shema to be the most important part of the prayer service in Judaism. It is twice-daily recitation as a religious commandment. It is traditional for Jews to say the Shema as their last words. The words are "shema yisrael adoni elohanu adoni achad shema yisreal adoni elohanu adoni achad (silently) baruch shem kvod malchoto leolam vaed.